My nail of the day yesterday (and technically today because I'm still wearing it) turned out so awesome that I just had to take a few pictures and share it with you. Yesterday was one of those days where I kept getting frustrated and re-doing my nails every time I'd put something new on. The polish bubbled because I rushed and did my coats too thick, this color wasn't what I had in mind, this one has such bad formula that I don't have the patience to finish my other hand, so on and so forth. Eventually I just gave up on trying to use a color I hadn't worn yet and decided to go with something I already knew I liked (that would be Kat Von D High Voltage Nail Lacquer in Wonderchild). When I was finished applying it, I was happy with how it looked... But then I glanced over and saw my bottle of Finger Paints Twisted sitting there on the table and thought what the heck... Let's try it. If I'm already wearing a polish I love, putting another polish I love on top of it is better, right? Luckily, this time it was! 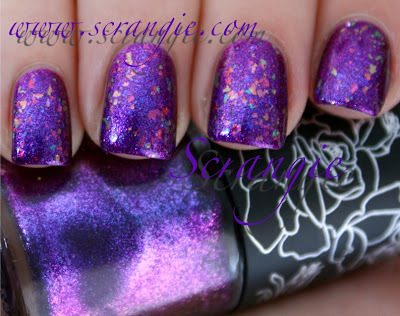 This is Kat Von D High Voltage Nail Lacquer in Wonderchild (three coats) topped with Finger Paints Twisted (one coat). I only did a very thin coat of Twisted because I needed this to dry quickly, but even with such a thin coat, it still had just the right amount of flakes. The flakes take on more of a pastel look over Wonderchild and it reminds me of Easter candy. The flakes also make the already shiny/sparkly finish of Wonderchild look even more metallic. 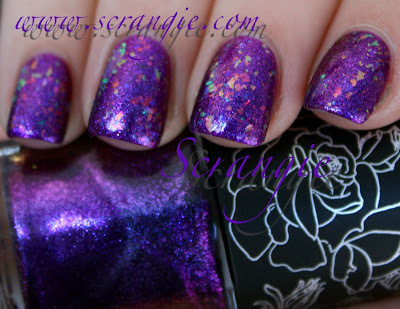 Everything looks super glowy and bright and reflective and the little flashes of rainbow color from the flaky topcoat compliment the duochrome pearls in Wonderchild perfectly. Very happy with how this layering experiment turned out. I love it! Reminds me of a carnival or something fun and kind of whimsical. Wow! 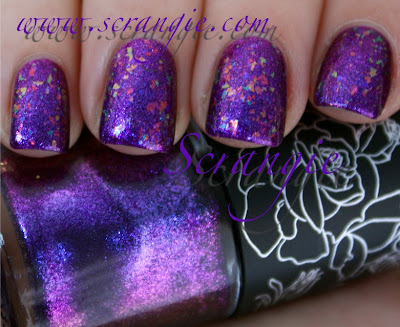 That Kat polish is sooooooooo gorgeous! Flakies give such a cool look to so many colors. I'm wearing a very light pink polish with twisted on top and it has so much life when light hits it. Oh wow! What a stunning combo! I was really hoping to get that with a gift card I had but the Sephora by me did not have it!! ACKKK!!! I might need to order it upon seeing this. That's a very pretty combo. I wish I could get my hands on the Fingerpaints flakies! OMG I think this pic just sold me! 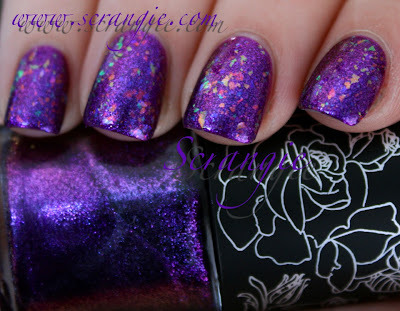 I feel like I need this Kat Von D polish now! Your swatches are amazing! Purple isn't my favourite colour but this looks really nice. Oh what an amazing combo! So many colors! Beautiful combination. Love purple & adding flakies is superb. I love this! The rainbow that the flakies reflect remind me of Fruity Pebbles. It's one of the prettiest layering I've seen in a while! we match! I'm working a few-day-old Twisted mani too, but it's coming off tonight. Too much tip wear, meeep. I'm wearing Twisted over OPI's Uh Oh Roll Down the Window right now - it's such a pretty flaky. I'm glad I was able to get a few of the Finger Paints Special Effects before they were gone. I just had one of those days, sat rifling through my polishes looking for the 'right one'...in the end I settled for a simple red and gold leopard mani. Old habits die hard!!! Love this look, anyway, might have to try my flakies over a purple next time! Oooh, this gives me ideas :) !